Background: The man who would become Spartacus was a noblemen from Thrace who struck a deal to combat the Greeks with the Romans. It was an uneasy alliance, but he stayed true to it, until the Romans abandoned him, and eventually forced him and his wife to slavery. 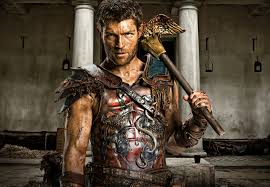 Spartacus would rise quickly as a gladiator, and would come to lead an all-out revolt against Rome. Over the course of his slave rebellion, Spartacus defeated several legions, created an army of 30,000+ slaves, and even conquered a Roman city. He is a very skilled swordfighter, brilliant tactician and strategist and can even inspired his worst dissenters to his cause.